You will need at least a few hours if you are going to read the contents of this site. Therefore sit back and relax and have a good read. If you are a left-wing socialist, an active feminist, a vociferous fairy or you just voted Liberal in the last Canadian election, you will not be happy here so click on out of here now. This web site is designed to make you think. Here you will learn the problems within Canadian politics. You will learn about the flaws in the Charter of Rights. You will learn about the extreme national debt, HRDC, Western Alienation, the appointed-for-life Supreme Court of Canada, Quebec referendums and CIDA. You will not be pleased if you are a socialist although you will be educated. You are allowed to read this site even if you are a socialist, pinko, homosexual communist. It's not your fault you have that problem. Prime Minister Chretien has just been elected for a third term as prime minister. This wily old politician knows the Canadian political scene better than any Canadian. And although he is a left-wing socialist, we have to admire his balls and ability not to get caught. 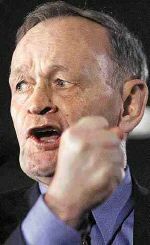 Prime Minister Trudeau, recently deceased, along with his then Justice Minister Jean Chretien, wrote the flawed Canadian Charter of Rights in 1982. Look over at the menu on the left side of this page and pick what you would like to read.